I'm in the process of learning how to animate my pixel art and decided to have a look at some of the classics. I extracted these animations using ZSNES and turning off all the layers except the sprite layer (by pressing numbers 1-5 on the keyboard) and recording it at 60fps using OBS. i then imported the resulting video file into Adobe Photoshop CC and trimmed it until I ended up with a loop. I then exported this as a gif. Below each gif I have included a spritesheet of the individual frames as these are helpful in seeing how each animation actually works. Pay attention to how long each individual frame is used to create different sets of movements. I hope this is helpful for other people learning to do the same. This is for educational use only and all copyright belongs to Nintendo and the respective developers of each game. Nintendos work on this is a thing of minimalistic genius. Pretty much just 2 stills that last 6 seconds each create one of the most iconic running animations the world has ever seen. This animation uses 6 sets of "legs", with each spanning 8 frames of animation. The legs for each set does not change. It is interesting how it still produces the illusion of smooth motion. Note the subtle kickback animation on his upper body from the gun shots. This is one of my favourite pixel art animations of all time. I love the clean lines and dynamic movement. It really doesn't get much better than this. 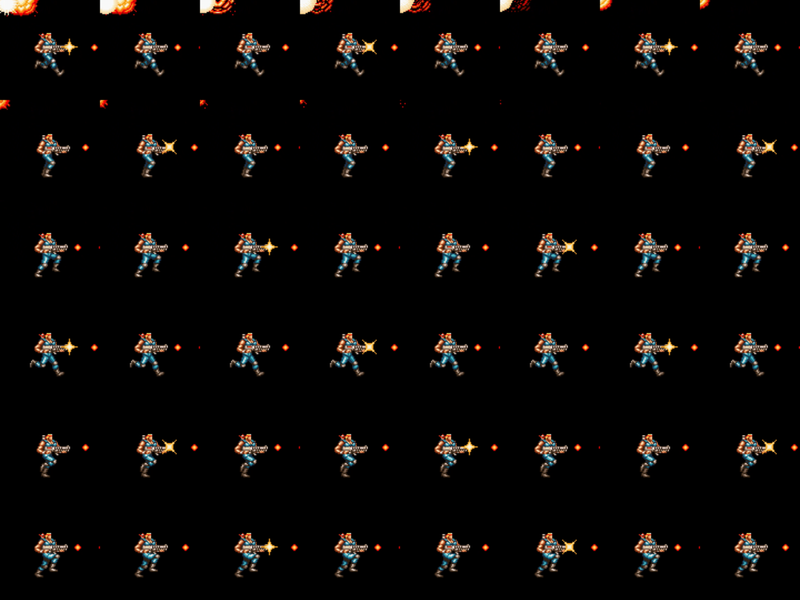 This animation has the same amount of frames as the example from Contra III but is much more complex. It covneys the "squishiness" of the character quite well. Another complex animation. Disney has done great work capturing the essence of the animated film in such a low resolution. Note how Aladdin's hair is synced to the point where he switches legs.